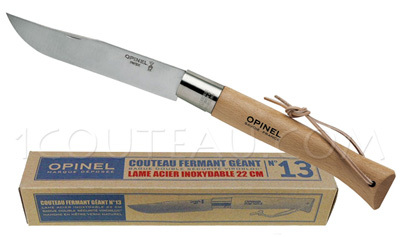 Manufactured in the French Alps (Savoy), the Giant Opinel folding knife N°13 is ideal for cutting meats and cheese. The blade of this knife is made of' Sandvik stainless steel developed by Opinel and renowned for its incomparable cutting properties, corrosion-resistant, it does not require any special washing upkeep. The natural varnished beech wood handle is pierced at the end and equipped with a leather strap. The safety of use is guaranteed by the double safety ring «Virobloc» which locks the blade in open position as well as in closed position. To make sure that it works properly, it is important to grease the hinge regularly, to store it in a dry place, and to not washing it.up in a dishwasher. Opinel is proud of its meticulous production process and its extremely high-quality products.